I think it's becoming somewhat of a tradition that I put up my little Christmas tree at the last minute. I almost didn't do it this year, but I figured I should put it up now that I have my own place. Now all I need to do is wrap some presents. Last minute Christmas tree, originally uploaded by flyingroc. Merry Christmas Roy. 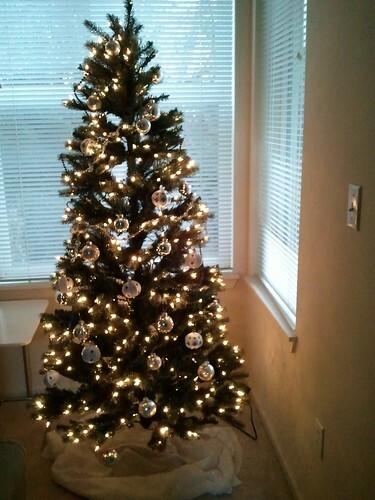 :) The tree looks great. Merry Christmas... Did you cook the dinuguan? The tree is more festive now that it has a home of its own. Merry Christmas!!! Merry Christmas! Had a nice Christmas Eve party at the house with friends, and went to midnight mass. Which is actually at midnight here, hehehe.